REFLEX RACING is now sponsoring this event! PN Racing is now sponsoring this event too! J.B R/C is now on the sponsor list! Chick-fil-A is now donating as well! This is going to be a special event for us at MBMZR, as this is a very special day for us, and me personally. The friends I have made in this hobby are what has given me so much enjoyment, and the drive to continue even when times were tough. It's not just a race event for me, but a very big "kick-off" event for my new endeavor, and I hope to share it with all the friends I have made in this wondrous hobby! I will run 3 classes, with the possibility of a fourth. The possible class is a novice class directed at beginners, kids, and lower skilled racers. The rules will be very loose, as I want there to be a place for every one to feel comfortable racing. I will run this class as long as we have four participants. The main three classes will be Can Am 1 (basically an ll out mod class with prototype bodies, lexan included), GT1 (modified GT cars), and Kyosho Stock. The stock class will allow only very limited upgrades to make it easy form one to buy a car, and race it competitively. Detailed rules are to follow in the next post. Pit space will be available on a first come, first serve basis. Spacing and electricity is ample, but you may want to bring supplemental lighting, a pit mat, and a power strip. The store will be locked at night, so those who want to leave their stuff Friday night can. It will be in a public mall during operating hours, so it is "at your own risk". We will do our best to watch it, and I am sure there will be racers there until we close, but it just isn't as secure as our facilities have been in the past. Hours of practice and a race schedule will be posted shortly. We recently built and tested new elevations/transitions at our CFI location. I can say they are much more smooth than the ones we used in the past. We used metal framing this time instead of plywood, with a plywood topping, instead of the foam. They are a bit heavier, but in the end it is worth it, as they sit flatter, and we were able to mold the actual transition much better. For a point of reference, here is the last layout we ran as a test layout with these at CFI. The new store will have more space for a similar, but bigger layout, and I have some thoughts that will make it different than anything else I've ever done! And as a little teaser, here is a shot of where the new track will be. 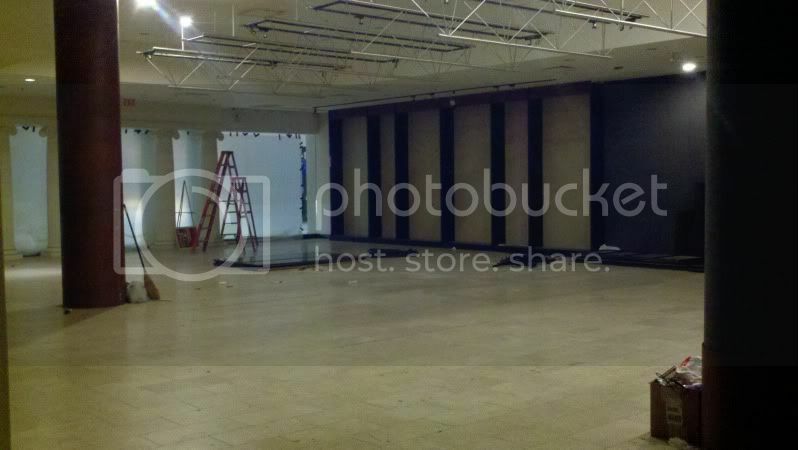 Of course the store is rather bare now, but construction is under way! 15 and under are free with a paying adult, or half price without an adult. For Adults it will be $20 for the first class, $10 for the second, and $5 for the third. Transponders will be available for rent for an additional $5, or you can use the house transponders and turn them in after each race. Friday night practice will be discounted from our normal rate (for event participants only). It'll be $5 for 2 hours, or $10 for the day. Again 15 and under is free with a paying adult. Transponders will be available for rent as well. Friday, we will be open from 10am til 9pm. The track layout will be put down on Thursday night, so it will be available all day Friday for practice. Like a typical MBMZR event we are going to try and keep a fast pace for the race day. This allows us some leeway when things don't go according to plan (for racers and the host), and also allow a lot of travelers to save on hotel rooms for Saturday night. This is just a projected schedule. It will vary from this on race day, as I still don't know the exact heat counts or number of participants, but this should be a very good estimate. See below for more details, and stay tuned for updates!! Last edited by hrdrvr; 2011.10.31 at 04:02 PM. Chassis: Any Kyosho 2WD Mini-Z chassis excluding formula 1. Wheel wells may be altered for tire clearance but may not be trimmed fore or aft to accommodate alternate wheel bases. Cabin windows must be retained but may be lightened internally, polycarbonate (Lexan) windows NOT allowed. Headlight buckets and lenses or covers must be retained. Taillight lenses and housings must also remain installed. The rear fascia maybe cut but only minimally for track clearance. Small body parts such as mirrors, canards and exhaust pipes must be installed, but canards can be slightly modified to keep from catching on track walls. If something is to break while on the track, it does not have to be reinstalled. Reinforcement to the inside of the body is legal, but hidden from view while looking at the outside of the body. The body must appear stock as Kyosho intended it to look. Electronics: Kyosho standard electronics only. FET upgrades are NOT legal. Batteries:	4 x AAA NiMh or Alkaline (Lithium based batteries NOT allowed). Wheels:	Wheels must be original to the body being used. Tires:	Any rubber tires that properly fit on the wheels. Motor: Kyosho stock motor only. Motor Mount: Kyosho plastic motor mount associated with the body selected only! Suspension: No upgrades allowed. Shimming and modding (modification, not exchange for aftermarket) is allowed, but only suspension that is associated with the stock motor mount and body are allowed. Ex: No fitting of LM damper to 98mm pods, etc. Only a top spring is allowed for anything other than LM. Greases and oils are permitted. Only parts associated with the stock front end can be used. Parts can be modded, but not used on a different front end. Ex: No MR-02 king pins on MR-03s front ends. Bascially, you can do what you wish with the parts that come with the kit, but you can NOT add anything other than these parts. Stock springs (front and rear) ONLY! Stock T-H-plates ONLY! Bearings: Bearing of any brand may be used. Okay, So I am still getting flooded with questions and comments about the Stock class. I want to make one last clarification. This should make it easier to follow. You use what is in the box only, plus bearings and tires. You can not modify the chassis in anyway. The little yellow cap on the motor can be removed (only because some stock replacement motors do not have them). The only modifictations allowed to the body are reinforcement (It must be done within the body, so it can not be seen) and decals. Please keep the decals to tasteful level. These should be used to add color to darker bodies, and for a visual distinction from popular bodies that will likely get run by many drivers. I encourage the use of decals to customize your car for BOTH of these reasons, but retain the right to reject anything that I deem is overboard. One example I can think if is huge "name" graphics across the windows of the cars. Please remember, this class is for driving, and showing off ASC bodies! DON'T MAKE IT MORE COMPLICATED THAN IT IS!! This should be the most simply written class, and it is getting so much attention that I feel like dropping it for a more Landon typical class, and not limiting anything but motor. I know that would be a mistake, and hopefully this will be the last clarification. All the previously posted rules in the Rules section still stand. This class should be the most fun, with the least investment, and the closest racing!! Body:	Kyosho ASC, White Body or equivalent (R246, TRP, Iwaver, X-Mod, etc...) hard plastic bodies allowed, excluding LM-LeMans Prototype bodies or Can-Am/Pan-type bodies. No thin shell Lexan/polycarbonate bodies allowed. Bodies may be altered for wheelbase but a maximum wheel opening of 31mm measured horizontally must be maintained. Wheel wells may be altered for tire clearance but the body must cover the tire completely when viewed from above. Cabin window must be retained but may be lightened internally, polycarbonate (Lexan) windows allowed. Headlight buckets may be removed but lenses or covers must be retained. Taillight lenses and housings may be removed. The rear fascia or bumper maybe cut but no higher than 18mm from the chassis bottom plane. Holes are legal in the remaining fascia. Small body parts such as mirrors, canards and exhaust pipes may be omitted. Front air-dams, splitters and body sides may be trimmed for track clearance. Wheels:	Any Mini-Z type wheels, plastic or aluminum. Motor: Any 130 size brushed motor. Brushless not allowed. Body:	Atomic VDS (any version), PN Pan Car (any type), Le Mans Prototype or Can-Am style polycarbonate (Lexan) body (open or closed ****pit), Kyosho Le Mans ASC, White Body or similar. Tires:	Any rubber or foam tires. Batteries:	7.4V max. (Lithium based allowed). Motor: Stock Kyosho, ReflexRacing 70t, PN 70T, or 80T. May look into providing PN 80T hand-out motors, so this is subject to change. Any questions and comments will be addressed! Please let me know what classes you plan to participate in, so I can update the divers list! Last edited by hrdrvr; 2011.10.31 at 02:42 PM. If you come around to the back of the mall, our back entrance is on the sidewalk leading into the theater (from the south side). If you come in the entrance at the theater, come into the mall, then turn right. We are the second store, just passed Victoria's Secret. If you come in the entrance just south of there (usually the best for parking), you come in and turn left, and we are the third store, just passed Bath and Body Works. If you look at this map (it's hard to read) we are in number 70. It's in the green section, in the middle of the middle section. If you come in by the theater (Carmike 12), you turn right, and we are on the right. If you come in the entrance just south (left on the mall map), you come in and turn left, and we are on the left. As early as most of us are going to be showing up, the prime parking spots will be available. The entrance next to the theater is closer for those parking in handicap spots, otherwise, they are equal. The bottom of this map faces the main highway (17), so you need to come around the back of the mall to get to those doors. I usually come in around the Bass Pro end, as it will be bring you right to the doors I recommend coming into. As you know, Myrtle Beach is full of 'em There are a number of hotels on the beach, and we are very centrally located between Myrtle and N Myrtle. Any hotel you chose won't be too far. I will give links to a few that look like good choices to me. I don't stay in hotels too often at the beach so my experience is limited. The Fairfield Inn is the absolute closest hotel, and is less than a quarter of a mile away. A double room is $70 from expedia right now. There is a Courtyard by Marriott at Barefoot Landing, which is right down the road, and is a shopping and restaurant mecca for those bringing family along. They are $80 on expedia for a double. If you don't mind a 10-15 minute drive to the track, you can find numerous hotels at the beach for under $50. One example is the Boardwalk Beach Resort, which is running $40 for a double for Friday night, through expedia of course. I found these with just a few minutes of searching. You can always plug the address in to check proximity, and if you are viewing a map, the mall is at the intersection of Hwy 22 and 17. It's pretty easy to spot, to make a judgement on distance. Feel free to make any recommendations you know, or ask me any more questions you might have. Look forward to seeing every one in a month! Last edited by hrdrvr; 2011.10.16 at 11:20 AM. will this be a permanent location? Man this is exciting Landon! Memories of the Spring Fling at 843 are flowing through my mind! You guys had a great following back then. Can't remember how many entries but it seems like at least 50 over half of them locals. The mall traffic is sure to bring some new racers aboard. I am sure that a venue open 7 days a week will be a plus for some of the off road guys too. Congratulations and much success to your new endeavor!!!!!!! Lincoln and I will be there to show our support! Grant, yes. This is a new store I am opening. 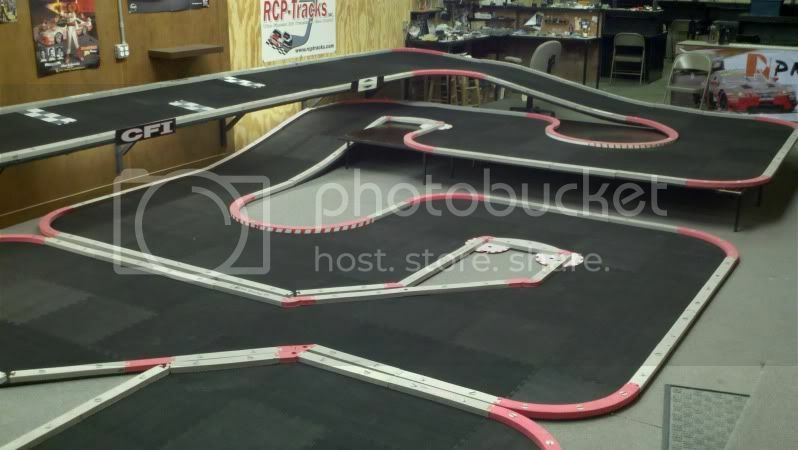 We will focus on Miniz and other micros with a couple of permanent tracks, and a full time racing schedule. Great News Landon!!!! I look forward to coming down and racing in your new store! Count me in. LET's Go Racing... catchy! Is your middle name Ernest? Edmund? Edsel? Ehud? Elroy or Elvis? I am sure it will be the coolest track in the area if not the nation! oh it will be the biggest baddest track in the world. 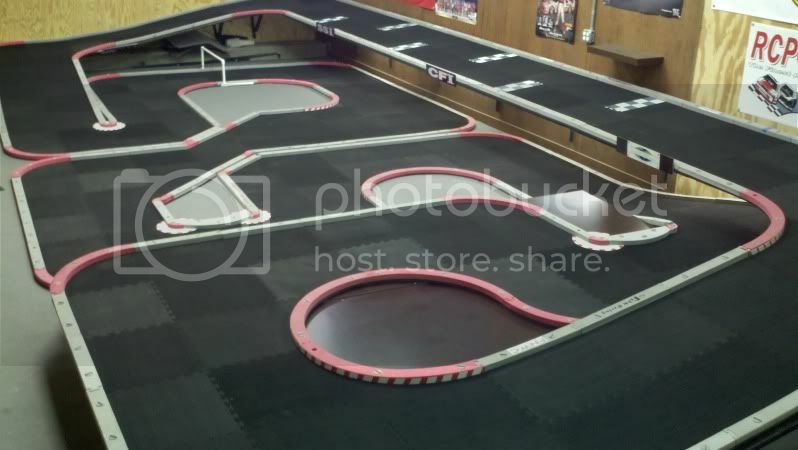 i cant wait for it to get opened and we pick up another 40-50 racers. its going to be a blast. i went by the last couple days to see the progress and its coming along fast. he still has a lot to get done but when everything is done its going to bring mbmzr to a whole new level. Pedro, My middle name does start with E, but it is none of the ones you listed. If you can guess it, Ill hook you up with something free when you come down for the event. I'll even give you some clues. It only has 3 letters, but you use all of them twice. The three letters are some what of a conundrum. I hope this brings many new faces into the class. Best of luck to you. Another reason to visit when I see my brother in law next spring! Awesome news Landon! Wow Landon, that's pretty cool. At ILR, a lot of people walk in and try out the rental cars. I don't know if you plan to do this but I think it is a good way to get people to buy the cars...hopefully bringing you new racers.